Awake, again, into this week of making new friends, working on our projects, wanting to get to know everyone even more, even better. When I wake at 6 and slip, seamlessly, from bed into warm pool, a new friend is swimming laps beside me. Soon, I am outdoors, climbing toward the sky up the trails to the lookout in the fresh cool air of autumn, looking down. This week is a peak experience of framing my creative life over the next chapter. Tonight, our group sat around a fire kindled in a comfortable room. One of my favorite ways to spend an evening: we each read something we wanted to share for five minutes. 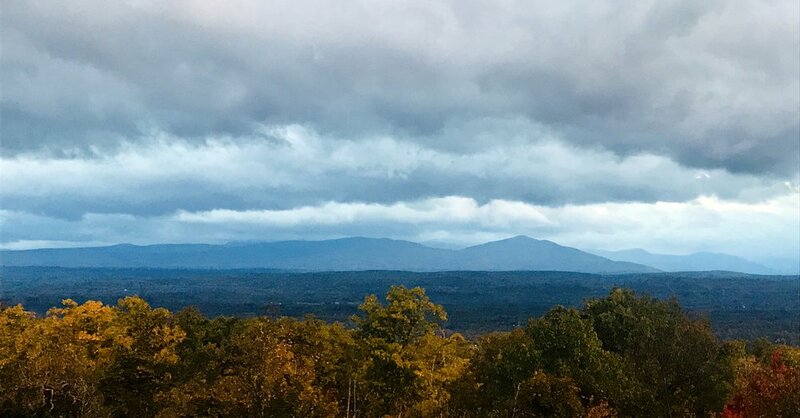 I went first and shared three poems and the photos that inspired them: Monadnock, Pinked, and All These Cures. Others read blog posts or sections of their books or short prose and one woman sang an original song and played guitar. Now, I know each person more and still want to know more, because she and he let me see such an intimate, vulnerable creative side. the yeasty promise of pastry curling and browning. cups on saucers she sets steaming under your nose. and you learn to let that be a nice surprise. of who you must serve in her absence.